It is remarkable how our mind works. We have millions of thoughts that run through it. As our daily lives continue, we struggle. Temptation comes our way and we think about it. We wonder whether to act on it or overcome it. Our best choice would be to overcome it. However, it is easier said than done. So, how can we overcome thoughts brought about by temptation? Well, we can chose to do the right thing, if it is too much to handle, we can take it to God in Prayer, or if we feel we are about to cave in, we give it to God to handle. 13 No trial has overtaken you that is not faced by others. And God is faithful: He will not let you be tried beyond what you are able to bear, but with the trial will also provide a way out so that you may be able to endure it. The problem with thoughts that carry temptation is that we are at risk of acting upon them. We can be tempted in so many ways that our reasoning could be curved and influenced into thinking is ok to go through with them. Unfortunately, if we act upon them, we now face guilt, shame, and many other convictions that we must live with. Thoughts can flood our minds and run through it like a mad river. We obsess over the object of our temptation and we come up with many scenarios on how to justify acting upon our tempting thoughts. Our mind is a wondrous machine that can video play many of the outcomes with vivid results that can entice us into stepping into the forbidden world. However, as Christians, we have the guidance of the Holy Spirit that can help us discern right from wrong. It is its influence that will carry us through and help us do the right thing. If the thoughts are too much to bear and we are failing at doing the right thing, talk to God, talk to Jesus, and pray to be helped. It is ok to admit we are weak and we need help. God only gives us trials that we can bear. If we are failing at doing the right thing, ask for help. The benefit of being a Christian is that we are never alone. God is on our sidelines watching us, leading us, and listening to us. Let him lend you a hand with your problem. Like the loving father that he is, he will hold your heart and help you through any situation. 7 The Lord is on my side as my helper. 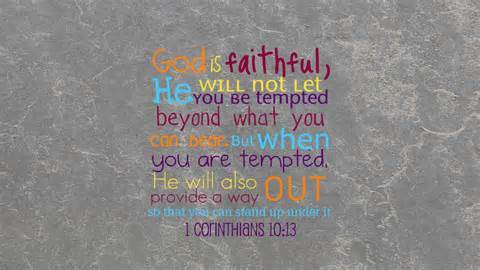 When God knows that we can no longer bear the problem, thought, or temptation, he provides a way out. That is him. He is our way out. Give him your thoughts. Give him your temptations. Let him carry you through. 22 Throw your burden upon the Lord, and he will sustain you. It is not easy to go through with the above, but fervent belief, faith that is unconditional, and love for the truth will be our Holy Spirit’s guidance and advice. Pray to God and let him help. Finally, give God all you can’t bear. Let him be the one that solves our problems, removes our burdens, and opens up our hearts to be filled with inner peace. God be with us today and always. Categories: god | Tags: Acts of the Apostles, Bible, God, Holy Spirit, Jesus, Lord | Permalink.